Home » Nanomaterials » Comment » Nanotechnology and liquid crystals: How to figure out whether contaminated with ions nanoparticles can actually purify liquid crystals from ions? The dependence of the concentration of mobile ions in liquid crystals doped with nanoparticles on the weight concentration of nanoparticles. The contamination of nanoparticles is quantified by means of the dimensionless contamination factor v. Depending on this factor v, three different regimes mentioned above can be achieved. The majority of modern liquid crystal devices such as laptops, mobile phones and TVs are typically driven by an electric field. To ensure the specified performance of these devices, liquid crystals should be extremely clean, free of any ionic contaminants. Ions in liquid crystals compromise an overall performance of the device by causing undesirable side-effects such as image sticking, image flickering, and slow switching. To avoid these effects, modern devices utilize high resistivity liquid crystals, practically free of ions. However, even highly purified liquid crystals can get contaminated with ions in uncontrollable way while assembling or operating the device. As a result, new methods for permanent purification of liquid crystals are needed. A solution can be found by merging liquid crystals and nanotechnology. Nanoparticles dispersed in liquid crystals can capture some mobile ions thus reducing their concentration. This very simple concept was tested by different independent research groups. It turned out that nanoparticles in liquid crystals can actually lead to both purification (the reduction in the concentration of ions) and contamination (enrichment with mobile ions) regimes. Moreover, some liquid crystals doped with nanoparticles exhibit even more complex behavior. 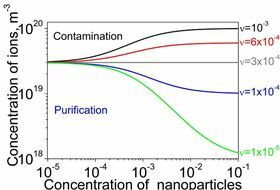 For instance, the initial contamination regime (at relatively low concentration of nanoparticles) can be followed by the purification regime at higher concentration of nanodopants (more details can be found in a recent review ). These puzzling results remained poorly understood until now. The transfer of this concept (“nanoparticles enabled permanent purification”) from academic sector to R&D commercial labs was slowed down, if not stopped. Recent series of papers [2-6] shed some light on these phenomena. By considering nanoparticles as partially contaminated with ions, very simple yet efficient formalism has been developed. This formalism predicts three possible regimes, namely, the purification, the contamination, and no change at all . Switching between these regimes is governed by the interplay between the ionic purity of nanoparticles, the ionic purity of liquid crystals, and the ratio of the adsorption rate to the desorption rate . An example of these different regimes is shown in Figure 1. Formalism developed in  (this paper has been selected as an APL Editor’s pick) resulted in four subsequent publications [3-6]. Three of them were published in Liquid Crystals [3-5], and one paper appeared in Chemical Physics Letters . The proposed approach, within the limits of its applicability, can describe a broad variety of existing experimental data [4,5]. In addition, it provides a way to design highly efficient ion trapping nanomaterials . In regard to ion trapping capabilities of different nanomaterials, the parameter called the ion trapping coefficient is very useful. In the purification regime, this parameter is positive and equals the fraction of ions trapped by nanoparticles. For example, if the ion trapping coefficient is 0.3, it means that 30% of mobile ions are captured by nanoparticles dispersed in liquid crystals. The ion trapping coefficient is 1 if all ions are trapped (100 % purification). Interestingly, in the contamination regime, the ion trapping coefficient is negative. Figure 2 shows ion trapping coefficients of nanoparticles dispersed in liquid crystals. Nanoparticles are characterized by different levels of their ionic purity. Figure 2 is deduced from Figure 1 according to procedures described in . The dependence of the ion trapping coefficient of nanoparticles dispersed in liquid crystals on their weight concentration. Nanoparticles are characterized by different levels of their ionic purity quantified by means of the dimensionless contamination factor v.
The ion trapping coefficients of various nanomaterials dispersed in liquid crystals were reported in . Results presented in  can be helpful for R&D engineers to evaluate nanoscale materials suitable for their needs. Papers [2-6] can explain seemingly contradictory findings reported by independent research teams. The results can be viewed as contradictory if 100% purity of nanoparticles is assumed while trying to explain them. In reality, nanoparticles are not 100 % pure and their possible ionic contamination should always be considered. An important practical conclusion obtained in [2-6] is to use highly purified nanoparticles. The ionic purity of nanoparticles should be checked by experimentalists. Otherwise, the obtained results could vary dramatically . 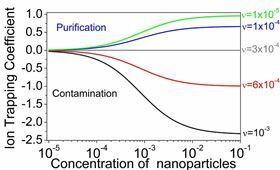 The ionic purity of nanoparticles sets a natural limit on their purifying capability as is shown in Figures 1-2. Once the ionic purity of nanoparticles is under control, the concept of permanent purification of liquid crystals from ions by means of nanoparticles is ready for its transfer to R&D commercial labs. Y. Garbovskiy, I. Glushchenko, Nano-Objects and Ions in Liquid Crystals: Ion Trapping Effect and Related Phenomena, Crystals, 5(4), 501-533 (2015). Y. Garbovskiy, Switching between purification and contamination regimes governed by the ionic purity of nanoparticles dispersed in liquid crystals, Applied Physics Letters, volume 108, issue 12, 121104 (5 pages), 2016. Y. Garbovskiy (2016): Electrical properties of liquid crystal nanocolloids analysed from perspectives of the ionic purity of nano-dopants, Liquid Crystals, DOI: 10.1080/02678292.2015.1132784. Y. Garbovskiy (2016): Adsorption / desorption of ions in liquid crystal nano-colloids: the applicability of the Langmuir isotherm, impact of high electric fields, and effects of the nanoparticle’s size, Liquid Crystals, DOI:10.1080/02678292.2016.1145270. For the first time, scientists have observed ion migration within hybrid perovskite crystals and related that to declines in its light-absorbing ability.